Draft: 2012, San Diego Padres, CAth rd. Zachary Adams Eflin (pronounced EFF-lin)… 2012 graduate of Hagerty High School (FL)… Participated in the Florida Atlantic Coaches Association (FACA) All-Star Classic…Hobbies: Fishing, golfing and playing guitar… Signed by: Willie Bosque. Began the season with Lehigh Valley (AAA), posting a 1.69 ERA in 3 starts before being recalled on 4/30... Took a perfect game through 5.0 innings in his season debut, 5/1 at MIA.. Struck out a career-high 9 batters on 5/7 vs SF, needing only 3.2 innings to surpass his previous high of 6 (twice, both in complete games)...Clubbed his first ML home run on 5/25 vs TOR...Went 5-0 with a 1.76 ERA (6 ER, 30.2 IP), 6 BB, 0 HR, 28 SO and held opponents to a .218 AVG in five June starts...Was T-1st in the majors in wins and HR/9.0 IP in June, and n the NL ranked 3rd in ERA, 4th in SO/BB (4.97) and 8th in WHIP (0.98)...Was the first Phillie to win 5 games in a month since May 2012 (Hamels) and the first to have at least 30.0 IP and 0 HR allowed in a month since April 2012 (Halladay)...Had a 32.2-inning streak without allowing a home run in parts of 7 starts, 5/30-7/3...Posted a career-long 11.0-inning scoreless streak, 6/22-7/3...Was on the 10-day DL, 7/15 (retro to 7/12) to 7/22 with a right middle finger blister...Won 6 straight starts, 6/5-7/3, joining Cliff Lee and Roy Halladay as the only Phillies to accomplish that since 2000; posted a 1.91 ERA (8 ER, 37.2 IP) in those starts...Pitched 8.0 innings on 85 pitches, 8/4 vs MIA, becoming the first Phillie since 2005 to finish a start with at least 8.0 innings on 85 or fewer pitches... Optioned to Lehigh Valley on 8/11 and recalled on 8/22, however did not miss a start because he served as 26th man for the doubleheader on 8/16...Allowed only 19 ER in 56.2 IP (3.02 ERA) from the fourth inning on in his starts, but surrendered 43 ER in 71.1 IP (5.43 ERA) in innings 1-3. Began the season on the 10-day DL recovering from off season surgery on both knees; activated and optioned to Lehigh Valley (AAA) on 4/11 following a rehab assignment with Clearwater (A)... Recalled on 4/18 after making one start for Lehigh Valley... Had a career-best 29.0-inning streak without issuing a walk, 4/18-5/10; longest by a Phillie since 2013-14 (Cliff Lee, 31.0 IP)... Had 3 straight starts with at least 7.0 IP and no walks, 4/18-5/4... Optioned to Lehigh Valley on 5/28... Was on the 7-day DL, 6/3-7/8 (right elbow strain); included a rehab assignment with Gulf Coast League Phillies (R)... Allowed 2 ER or fewer in 5 of his 7 starts with Lehigh Valley... Recalled on 8/8 and made 3 starts before being placed on the 10-day DL on 8/22 (retro to 8/19) with a right shoulder strain, causing him to miss the remainder of the season... Posted a 2.81 ERA (10 ER, 32.0 IP) in his first 5 starts of the season and a 9.46 ERA (34 R, 32.1 IP) in his final 6 appearances. Named the 4th-best prospect in the Phillies minor league system by Baseball America prior to the season... Spent the entire season with Reading (AA)... T-9th in the Eastern League in WHIP (1.21)... Selected as an EL midseason All-Star... Named EL and Phillies Minor League Player of the Week, 4/9-19... Began the season by throwing 15.2 consecutive scoreless innings over 3 starts... Pitched for Team USA in the Pan Am Games, 7/10-19 in Toronto, Canada; Team USA won the silver medal... Went 2-0, 1.38 ERA (2 ER, 13.0 IP) in 2 starts in the EL playoffs. Spent the entire season with Lake Elsinore (A)... Allowed 2 ER or fewer in 17 of his 24 starts (71%)... Posted a 3.37 ERA (46 ER, 123.0 IP) in 23 of his 24 starts; allowed 8 ER in 5.0 innings, 4/9 at High Desert. Began his pro career with the Arizona League Padres (R). August 22, 2018 Philadelphia Phillies recalled RHP Zach Eflin from Lehigh Valley IronPigs. August 17, 2018 RHP Zach Eflin returned to Lehigh Valley IronPigs from Philadelphia Phillies. August 16, 2018 Philadelphia Phillies recalled Zach Eflin from Lehigh Valley IronPigs. August 11, 2018 Philadelphia Phillies optioned RHP Zach Eflin to Lehigh Valley IronPigs. July 23, 2018 Zach Eflin roster status changed by Philadelphia Phillies. 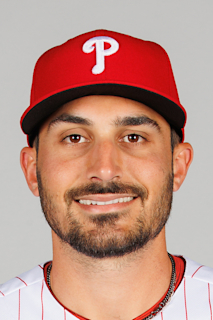 July 15, 2018 Philadelphia Phillies placed RHP Zach Eflin on the 10-day disabled list retroactive to July 12, 2018. Right middle finger blister. April 30, 2018 Philadelphia Phillies recalled RHP Zach Eflin from Lehigh Valley IronPigs. March 26, 2018 Philadelphia Phillies optioned RHP Zach Eflin to Lehigh Valley IronPigs. November 6, 2017 Zach Eflin roster status changed by Philadelphia Phillies. August 8, 2017 Philadelphia Phillies recalled RHP Zach Eflin from Lehigh Valley IronPigs. August 8, 2017 Philadelphia Phillies activated RHP Zach Eflin. July 9, 2017 Lehigh Valley IronPigs activated RHP Zach Eflin from the 7-day disabled list. June 29, 2017 Lehigh Valley IronPigs sent RHP Zach Eflin on a rehab assignment to GCL Phillies. June 4, 2017 Lehigh Valley IronPigs placed RHP Zach Eflin on the 7-day disabled list retroactive to June 3, 2017. May 29, 2017 Philadelphia Phillies optioned RHP Zach Eflin to Lehigh Valley IronPigs. April 18, 2017 Philadelphia Phillies recalled Zach Eflin from Lehigh Valley IronPigs. April 11, 2017 Philadelphia Phillies optioned RHP Zach Eflin to Lehigh Valley IronPigs. April 6, 2017 Philadelphia Phillies sent RHP Zach Eflin on a rehab assignment to Clearwater Threshers. April 2, 2017 Philadelphia Phillies placed RHP Zach Eflin on the 10-day disabled list retroactive to March 30, 2017. Knee surgeries. November 3, 2016 Philadelphia Phillies activated RHP Zach Eflin from the 60-day disabled list. August 19, 2016 Philadelphia Phillies transferred RHP Zach Eflin from the 15-day disabled list to the 60-day disabled list. August 2016 surgery in both knees. August 9, 2016 Philadelphia Phillies placed RHP Zach Eflin on the 15-day disabled list. Patellar tendinopathy in both knees. June 14, 2016 Philadelphia Phillies selected the contract of RHP Zach Eflin from Lehigh Valley IronPigs. April 2, 2016 RHP Zach Eflin assigned to Lehigh Valley IronPigs from Reading Fightin Phils. January 6, 2016 Philadelphia Phillies invited non-roster RHP Zach Eflin to spring training. July 22, 2015 Reading Fightin Phils activated RHP Zach Eflin from the temporarily inactive list. July 3, 2015 Reading Fightin Phils placed RHP Zach Eflin on the temporarily inactive list. April 5, 2015 RHP Zach Eflin assigned to Reading Fightin Phils from Clearwater Threshers. March 30, 2015 RHP Zach Eflin assigned to Philadelphia Phillies. December 19, 2014 Philadelphia Phillies traded SS Jimmy Rollins and cash to Los Angeles Dodgers for LHP Tom Windle and RHP Zach Eflin. December 19, 2014 RHP Zach Eflin assigned to Rancho Cucamonga Quakes. December 19, 2014 RHP Zach Eflin assigned to Clearwater Threshers. September 24, 2014 Lake Elsinore Storm activated RHP Zach Eflin from the 7-day disabled list. August 12, 2014 Lake Elsinore Storm placed RHP Zach Eflin on the 7-day disabled list. March 31, 2013 RHP Zach Eflin assigned to Fort Wayne TinCaps from AZL Padres. September 25, 2012 Zach Eflin roster status changed by AZL Padres. July 25, 2012 AZL Padres transferred RHP Zach Eflin from the 7-day disabled list to the 60-day disabled list. July 21, 2012 AZL Padres placed RHP Zach Eflin on the 7-day disabled list retroactive to July 19, 2012. June 20, 2012 RHP Zach Eflin assigned to AZL Padres. June 18, 2012 San Diego Padres signed Zach Eflin.